This Common Privet/Ligustrum ovalifolium was part of a large hedge growing in Faisal Waheedy's London garden that was collected during April 2010. Photographed is Francis Consunji-Chan digging the tree out of the thick London-clay it had been growing in for the previous 80+years. The collected Privet was wrapped in plastic bin-liner to keep the roots moist, taken home and bare-rooted before being potted up. By the following day the tree had been potted up and pruned ready for new buds and shoots to appear as the tree recovered from collection. I had heavily pruned the tree, removing the multiple-trunks that emerged from the trunkbase leaving a nicely tapered stump. The heavy roots that had been collected were also removed; Privet are exceptionally tough and will happily produce new roots from the trunkbase. The removal of any thick or long roots that would make planting the tree in a bonsai pot difficult in the future are better removed immediately after collection. By the Summer of 2011 the Privet had developed many new branches and was extremely vigorous. 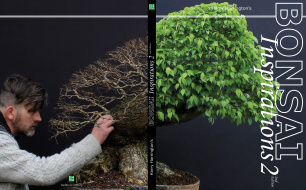 As is normal with broad-leaf bonsai, once the primary branches had been established and allowed to thicken during 2010, the tree had been pruned back hard, wired and the image above shows the resulting flush of new secondary branches.